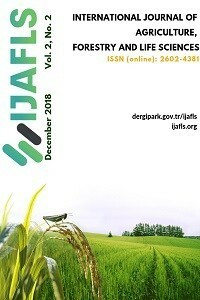 "International Journal of Agriculture, Forestry and Life Sciences" (Int J Agric For Life Sci) is an international journal, which publishes original research and review articles dealing with Agriculture, Forestry and Life Sciences (BIOLOGY and CHEMISTRY (If they are about Agriculture and Forestry)). IJAFLS is a Peer-Reviewed (Double Blind) and an Open Access Scientific journal dedicated to advancing Agriculture, Forestry and Life Sciences research. Journal publishes biannual (June and December) journal aimed at disseminating significant research and original papers, critical reviews and short reviews. The subjects referred to Agriculture, Forestry and Life Sciences of new methodologies that can be of interest to a wide audience of plant scientists in all areas of Agriculture, Forestry and Life Sciences. The journal encourages authors to frame their research questions and discuss their results in terms of the major questions of their research impact and value of their research, and thus in favor of spreading their studies outcome. The papers must be of potential interest to a significant number of scientists and, if specific to a local situation, must be relevant to a wide body of knowledge in life sciences. Articles should make a significant contribution to the advancement of knowledge or toward a better understanding of existing Agriculture, Forestry and Life Sciences concepts. An international Editorial Board advises the journal. The total content of the journal may be used for educational, non-profit purposes without regard to copyright. The distribution of the material is encouraged with the condition that the authors and the source are mentioned. Open Access Journal: Users are allowed to read, download, copy, distribute, print, search, or link to the full texts of the articles, or use them for any other lawful purpose, without asking prior permission from the publisher or the author. Google Scholar, Index Copernicus, ROAD, CiteSeerX, Scientific Indexing Services, ResearchBib, Eurasian Scientific Journal Index, Rootindexing. IJAFLS Journal is licensed under a Creative Commons Attribution-NonCommercial-NoDerivatives 4.0 International License.